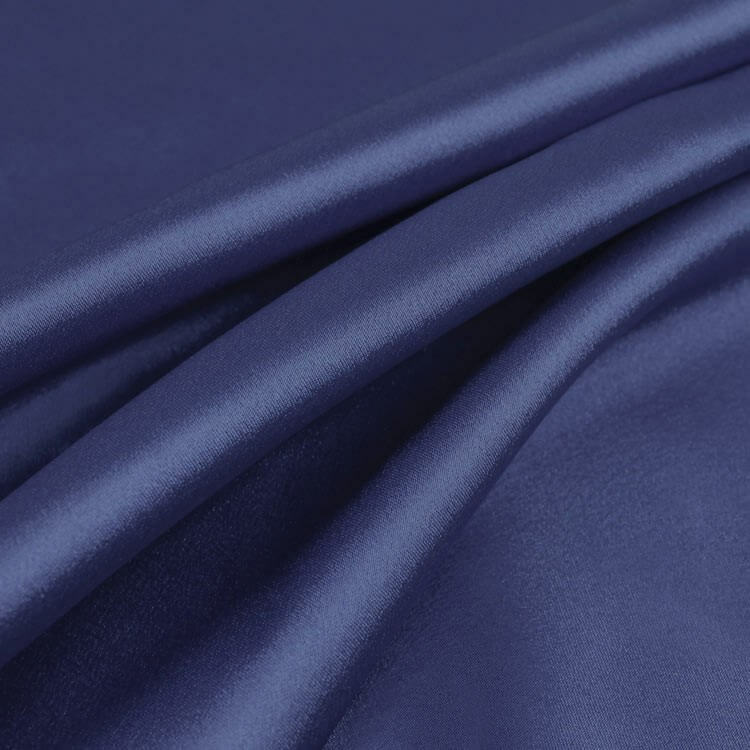 Charmeuse is a soft, lightweight satin fabric that drapes beautifully, making it ideal for lingerie and elegant evening gowns. It may be made from silk or more affordable polyester, but in both cases the floating surface threads give it a luxurious sheen. It differs from satin as it is more floppy and drapes beautifully. Charmeuse is commonly used for linings, lingerie, elegant wraps, evening dresses, dressy shirts and blouses, ties, handkerchiefs, costumes, and event décor. Though originally made from silk, polyester charmeuse is used for many applications because of its affordability. It can be used for apparel and for event décor, such as draping and formal tablecloths. You can also use printed charmeuse for a different look. Stretch charmeuse is often used in apparel because the two way stretch makes it easier to create fitted garments. A small amount of spandex is used in the material to create the stretch. For best results, dry cleaning is recommended. Charmeuse is slippery, so for more accurate cuts, cut in a single layer and not folded as you would with most fabrics. Use a fine universal needle, such as size 9/70. Fine polyester thread is best or use 100% silk thread if sewing pure silk charmeuse. Consider a machine embroidery thread as this is particularly fine. Since charmeuse is a soft, fine fabric, reduce your stitch length to 2mm. When sewing straight panels in charmeuse, French seams work well and give a luxury finish on the inside by enclosing the raw edges. 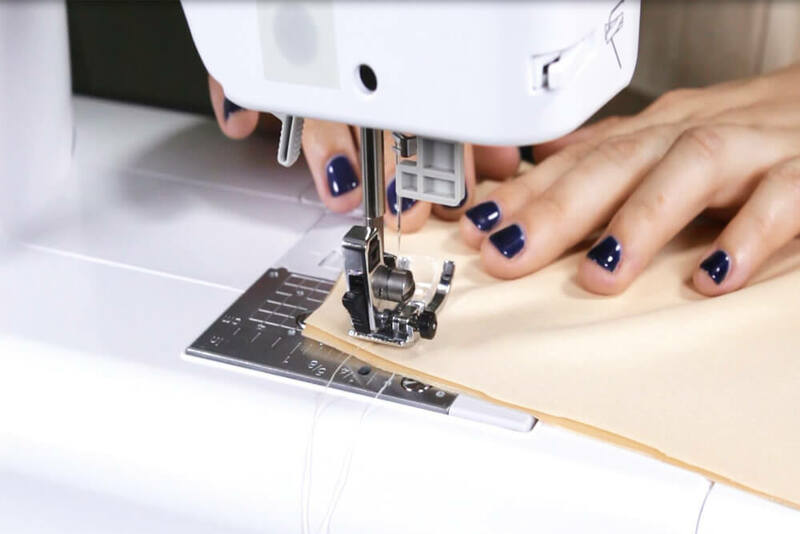 For shaped or curved seams use a serger for a narrow join, ideal for such a delicate material. A narrow, double folded hem is suitable for garments made from charmeuse, especially if the hem is shaped or curved. A deeper (5/8”) top stitched hem is appropriate for a straight edge that follows the grain because the weight of the hem helps to make the skirt or dress drape better. For a quick and neat hem, put a matching color thread on your serger and set for rolled hemming. Charmeuse is an ideal fabric to make a softly draping garment cut on the bias (diagonally across the grain). For nightwear or special occasion evening wear, a bias-cut is perfect so that the light catches the satin surface and produces a touch of luxury. For best results, cut pieces out in a single layer, placed over a cotton sheet or cloth. This under-cloth helps to support the charmeuse and prevents it sliding and distorting over the table while you cut. Use scissors with a fine serrated blade as this grabs the fabric and produces an easier cut, which is especially important when cutting diagonally across the grain. When joining panels together you may decide to use a stretch stitch or narrow zigzag so that the seam doesn’t pucker and threads don’t break when the diagonal weave settles and the seam extends. Some experts like to stretch the fabric slightly while sewing to add more length to the seam at this stage. If the seam ‘ripples’ you can normally press it into place later. Hang bias cut garments on a hanger or dress form before levelling the hem. It may take a day or two to settle but this means your finished hem will be straight. Charmeuse is soft and light so French Seams are a good choice as they completely enclose the raw edges of the fabric. Keep them narrow (1/4” or 6mm) for a delicate finish. A rolled or picot edge, either hand sewn or serged will give a light and dainty finish to a hem. On your serger, choose a decorative thread or one that matches the fabric color and thread this onto the upper looper. The lower looper and needle threads should closely match the fabric so that they blend in and won’t be noticed. For a rolled hem reduce the stitch length to 1mm, but if this creates a stiff edge, set the stitch length to 2.5mm for a softer, picot-style edge. Use a dry iron as drips of water may mark the satin surface of the charmeuse. Use a hot iron on 100% silk but a warm setting for polyester or synthetic charmeuse. Use a pressing cloth to protect the surface of the fabric if necessary. Ready to start your charmeuse project? Find all our charmeuse fabric here. BEST ANSWER: Yes, silk can shrink especially if washed in warm water. You should pre-wash silk if you plan on washing it in the future. Or it can be dry cleaned.